In case your stock remote control for Digihome 49287FHDDLEDCNTD TV is broken or for some other unknown reason you want to change it you can buy the RC4848 TV Remote Control. It is cheap and it has all the important remote control buttons that you may need for your Digihome TV. 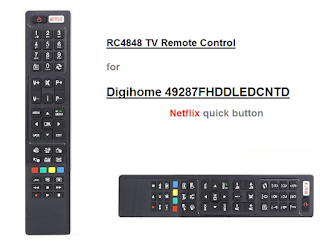 Prices for the genuine new RC4848 TV remote control vary around £5-5.50. Netflix - preset quick button. Unfortunately we don't have the remote control full specs at the moment. Stay tuned for more info.